Advanced Real Estate Co., PA can assist in the completion of 1031 exchanges. 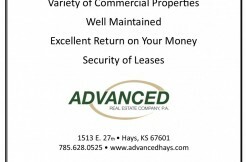 We can help with agricultural and commercial transactions in the Central and Western Kansas areas. The exchange of certain types of property may defer the recognition of capital gains or losses due upon sale, and hence defer any capital gains taxes. The properties exchanged must be of “like kind” of the same nature or character, even if they differ in grade or quality.